If you’re not a car person and you recently had the misfortune of scratching the body of your vehicle, you’re in a serious predicament, especially if you don’t know a mechanic you can trust. While asking around to try to solve this issue of yours, you will probably heard about paintless dent removal or read about it on websites like https://idbosse.com/. What exactly is this technique and should you consider it? Although its notoriety in North America is fairly recent, the paintless dent removal technique has been invented in Europe decades ago. As its name indicates, this technique is an effective way to repair small and large dents on a car, as long as the paint is not damaged and the dent is not too deep. If your car trouble meet these two requirements, you should seriously consider a paintless dent removal, but how does it work, though? In most cases, the technician will try to push the dent to the outside using tools like a magnetic ball embedded in a long handle. A tracer is placed on the bumpy side so that the exact location of the ball can be known at any time during the procedure. The technician then pushes outward on the ball handle (rigged to increase leverage) while watching the dent under fluorescent or LED lighting until the car has regained a smooth surface. Another method of paintless dent removal involves removing the dent from the front. Round discs (like suction cups) are glued to different sections of the dented surface. A rod is attached to each disc and the technician pulls heavily, bringing the dent out. If you’re in a tough financial situation, rejoice, because paintless dent removals are typically a lot cheaper than conventional bodyworks. We’re talking about savings in the range of 40 % to 60% compared to traditional bodyworks. This is primarily because of the other two main benefits of this technique. First, it’s a lot faster than the alternative, making you save big on labor. Second – and it’s related to the previous point – no input is used during the process (hence the paintless), making you save also in that department by keeping your original paint. 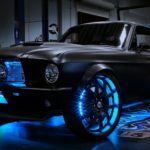 So the paintless dent removal technique is primarily known for being a relatively inexpensive mechanical procedure that’s faster than the alternative and preserve the original paint of the vehicle. It sounds like a good deal, right? Let’s examine some of its drawbacks, now. Of course, if paintless dent removals only had benefits, no one would do any other type of bodywork on their cars. Unfortunately, as we mentioned earlier, the technique doesn’t work on all kinds of dents. Deep dents where the paint has been damaged will require a more invasive body work. Plus, this method doesn’t work on some type of materials like plastic, rendering it useless to repair a large number of bumpers and other car parts that tend to use this material, especially on cheaper models. Finally, the tools used to complete the procedure can’t reach certain spots of the vehicle, which can be a bummer if they’re the ones that need attention. The paintless dent removal technique is the best method to use in the specifics scenarios it’s designed for: when you have a not-too-deep, not-paint-damaging dent that you want fixed quickly and for cheap. It may seem nitpicky, but the point of this method is not to be the ultimate bodywork. It’s to save yourself from a long and costly bodywork when the damage doesn’t require it, so take it if you can.